These cabinets were converted over the years to other games. All 4 have the original monitors, door and coin. All 4 have the control panel. Look very close, what you see is what you get. Originally, the 2 on the left were Stargate. Bottom of the Ninth was Moon Patrol. All 4 = 1 price, no cherry picking. You get the good with the bad. 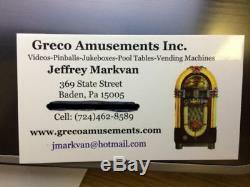 Greco Amusements, Inc- Baden, PA. We will be happy to provide you with additional pictures and videos upon request. The item "Lot of 4 Williams Video Arcade Machine Cabinets" is in sale since Friday, January 18, 2019. This item is in the category "Collectibles\Arcade, Jukeboxes & Pinball\Arcade Gaming\Video Arcade Machines". The seller is "grecoamuse18" and is located in Baden, Pennsylvania. This item can't be shipped, the buyer must pick up the item.